Knowlton Halloweens are special due to the incredible efforts of the residents, parents and children who join together in creating wonderful decorations and costumes to turn the Eastern Townships Halloween into one of the best family events of the year. Decorations started appearing after the fall Duck Festival as carved pumpkins began being spotted amongst the storefront decorations signifying that soon the great gathering of goodies would be taking place. The end of October is often a time of un-certain weather in Eastern Quebec so we're all used to expecting something strange for Hallowe'en. This past weekend saw, among other things: storming gusting winds that knocked down trees and actually cut power to many folks in the area, snow drifting and blowing that made us wonder if snow-tires should have been installed in August, and a falling back of the hour making the evenings even darker for us! You'd think that with such hardhsips there would be no time for Halloween? 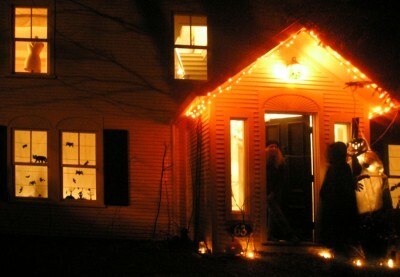 Lac Brome is well-known for it's ability to turn a holiday into something beyond the ordinary and this Halloween was no exception. 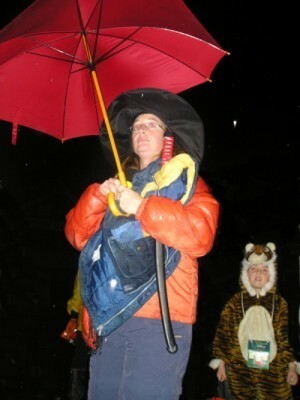 While the weekend snow turned to rain for Halloween the streets were still flooded with costumed youngsters and their parents wielding large umbrellas who were determined to maintain the Knowlton tradition of making Halloween something special. The Brome Fire Department were positioned on Knowlton Road and Victoria to distribute candies to the children and there was a steady stream of kids heading across the rain-speckled streets to the firefighters dressed in their full firefighting gear. The eyes of the kids were wider than a glowing pumpkins as the firefighters bent down from their trucks and dropped a wee sweet into thier bags! 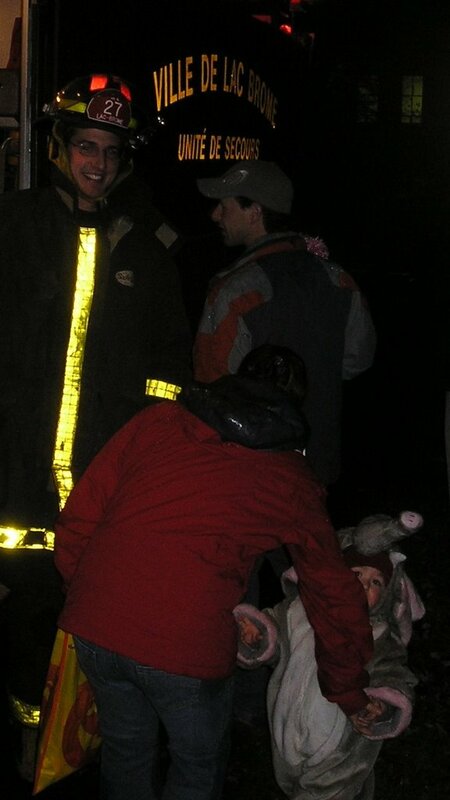 Throughout Lac Brome the flashing lights of the firetrucks invited the kids for candies and their presence was much appreciated. The rain glistening off of their bright rotating lights created the perfect atmosphere and as parents escorted their children around town for the candy pick-up they spotted the local firefighters proudly representing our community! Good for you all! So many homes and businesses give 100 percent in the preparation and decoration of their homes and stores for this one night of fun, it is a Lac Brome tradition that has gone on for years, and it is always so greatly appreciated especially by the children. Who among us cannot recall coming home after a night of Trick or Treating to count the chocolates, gums, licorices and suckers with a trembling anticipation. The same excitement was visible in the eyes off the disguised children tonight! 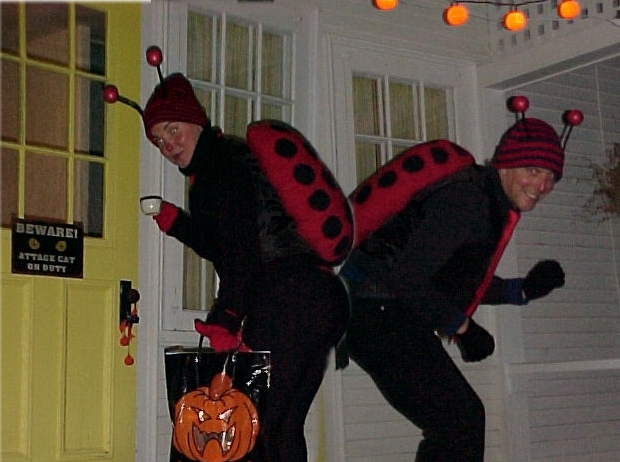 Despite the steady rain the fun started early as the shortened daylight gave way to spookiness around 5pm and candy-hunting kids were spotted running from house to house in Lac Brome. The most popular area for spooky trick-or-treating in Knowlton during Halloween is on Benoit and Landsdowne street off of Victoria. Of course, homes in all regions set up dramatic and intricate displays featuring spiders, ghosts and black cats there is something special about the area heading down to the Knowton Marina on Halloween that turns it into something that looks like a cross between Close Encounters of the Third Kind and One Flew Over the Cuckoos Nest. Every year the residents along this cozy neighbourhood stretch really outdo themselves with creating some of the most memorable and frightening exhibits imaginable. Every year is different along this stretch of road and it is always magical for the kids! There are often haunted houses set up in front yards and scary surprises like headless ghouls popping up from lawn chairs to scare the jeepers out of us! Folks along this stretch have built pirate ships, cemeteries and entire scenes of grouesome bloodiness that have left children squeeling with delight as they stuff their pillow cases with candies! The Knowlton Marina has always been one of the best loved Halloween stops for the kids...the lights reflecting off of Brome Lake and glorious lighting around the wooden marina are the scene for either flying bats and headles sailors or monstrous characters who climb from the waters of the lake to scare or spray the crowds who gather at the boat launch! As the pools of dark water danced with the rain drops the kids, disguised as hockey players, vampires, lions and princesses strolled between houses accepting bonbons from the witches, ghouls and magicians who had prepared so long for this one event. The efforts of so many residents who prepare for so long in advance is abvious and again we had a fantastic night for the kids of Knowlton! There were so many carved pumkins, custom made decorations and displays, creepy entrances and eerie music that even as a grown up it was unbelievable! Many thanks to everyone around the village who took the time to create another special moment for our children...this was such a fun night!What a great night we had...thanks to everyone!